Motorhome owner wins £500 in Caravan Guard prize draw at Wandhome! A lucky motorhome owner is the latest winner of our Win £500 prize draw after visiting Wandahome at South Cave, East Yorkshire. Mr Neil Holderness, of Hull, entered our competition whilst browsing for a new motorhome. Not only did he later go on to buy a new Auto Trail Frontier Serrano – but a few months later he was also given a cheque for £500 from Caravan Guard’s relationship manager Rebecca Brier! 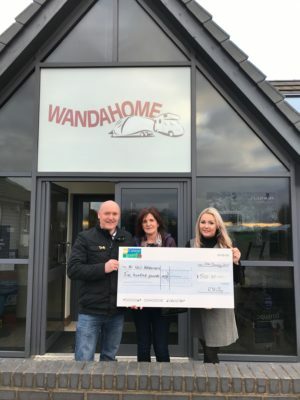 Rebecca presented Neil with the prize money back at Wandahome and found out how he’d recently switched from caravanning to motorhoming, and is loving it! Neil has big plans for 2017 – he’s getting married to Libby at Hull marina in June and they plan to travel around the Scottish highlands in their new motorhome for their honeymoon. But he hasn’t quite decided what to spend his prize money on yet. We work with a number of caravan and motorhome dealerships across the UK. To find out more about insuring your caravan or motorhome with us and our range of discounts click here.